If you run an ecommerce website, then you don’t need anyone to tell you that obtaining backlinks is hard work. Why would anyone want to link to a product page after all? But there is a way that smart ecommerce marketers can get backlinks and build authority, whilst also dramatically increasing conversions. It’s a predictable, repeatable process based on simple principles and reusable templates. And best of all, it’s something that you can put into action today. Great Content + Structured Outreach = More Traffic and Higher Conversion Rates. Well, it’s not and we’ve developed the Definitive Guide to Ecommerce Content Marketing which explains how it’s all done. Ecommerce content marketing – why bother? In recent years there has been an arms race between the SEO community and Google. Google finally took the nuclear option back in 2012 with Penguin and Panda which made life for ecommerce store owners even more difficult. Suddenly, natural links from authority sites was the order of the day. Now we all know that links are important for a good ranking, but getting links to ecommerce product pages has become even harder. That is where ecommerce content marketing comes to the rescue because it enables you to do exactly that – build high quality links from a wide variety of reputable external sites. Before you get started you will need to create a buyer persona. This is an avatar that you can create to visualise your ideal client. You’ll need to understand their needs, their desires and their concerns so that you can create content that addresses these points. Consideration – what options or alternatives are available? Let’s consider the options and look at the types of content you can create. It would be nice if we could easily create some content, publish it on our blog and get backlinks to it. That would be the logical extension of the belief that Google just gives more traffic to websites that publish regularly. Unfortunately it just doesn’t work like that, otherwise everyone would be doing it and we would be back to the dark old days of article marketing. But as we said above if you create great content AND you perform great outreach then you are going to get those all important high quality backlinks. So, before you start creating any content the first thing you will need is a list of influencers. These are the established authorities and the up and coming bloggers in and around your industry and marketplace. Now they don’t need to be writing specifically about your products or services but they will have an audience of your ideal clients. They will also have an established blog, be creating high quality content and have an engaged community of followers on social media. When we look at outreach we’ll look at the options available, but firstly you just need to create a list of influencers. Using a tool like Buzzsumo can help you achieve this. From this you can search for terms related to your niche, for example “clothing” + “blogger” and this will bring up a list of people who contain these two keywords in their Twitter bio. You are also able to sort these by relevancy, number of followers or by retweet/reply ratio. Additionally you can create lists to store these people and monitor your relationships with them. Now you can start to create your content. And there are several formats you can use. can get the work done relatively cheap. As an ecommerce merchant the aim is to sell and this is where conversion based content can really make a difference. The ‘How To’ Product Guide – With a foot in both the traffic and conversion camps, a well prepared ‘How to’ guide allows you to be perceived as a helpful expert. 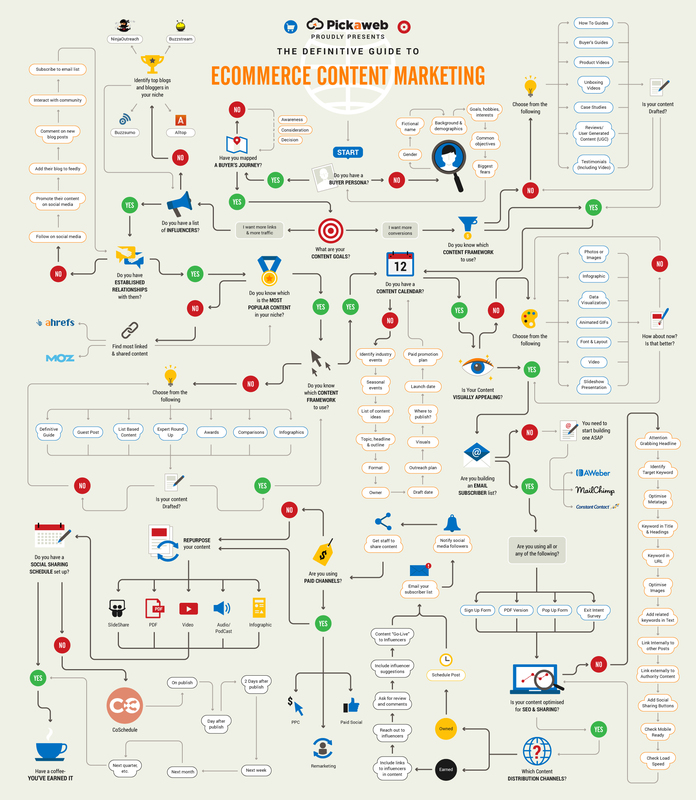 Click image to open interactive version (via Eommerce Content Marketing). Whether you use an excel spreadsheet or a specialised content calendar, you’re going to have to commit to creating content over the longer term. The more content you create the better you’ll get at it. Initially just create some outline ideas with headlines and think about the type of content format you want to create. Also think about your influencers – outreach takes time and you don’t want to leave that until the last minute so the sooner you start reaching out and building relationships the better. Whatever format you decide and for whatever purpose, one fundamental point you will need to consider is that visuals are important, even more so if you want shares and backlinks. Let’s be frank, attractive content is going to attract more shares and backlinks. The proof is in the fact that the most shared content in social media is visual. But equally important is just the pragmatic repurposing of content. It takes time, effort and money to create content so you want to get as much use out of it as possible and that is where visual repurposing comes in. Infographics – We’ve looked at them in their own right, but is there a way that you can visually interpret your content? It would be such a waste if you spend a load of time creating content only to fall at the final hurdle by not optimising it. This is especially important for any content posted on your blog or website. Once your content is ready you need to take it on a roadshow. The aim is to get as many eyeballs on it as possible – especially your influencers. Remember that list of influencers, you need to start following them on social media, sign up to their blogs, start commenting on their latest blog posts, make friends with their community and generally participate in their conversations. For serious industry bloggers this may take time and patience, but with some bloggers and industry blogs this can be a quick process. If you are linking out to your influencers in your content then you should get a favourable response most times just by emailing them to let them know. The type of content you are creating will hopefully be of high quality and visually attractive. So remember to promote one week, one month, three months, six months, after the initial publication. So that’s how you can develop a long term content marketing strategy for your ecommerce site using proven content formats. So are you using ecommerce content marketing yet or do you have plans to introduce it to your marketing sometime soon? Share your thoughts below. Tony Messer is the CEO and Co-Founder of UK Web Hosting company Pickaweb. The author of two books The Lazy Website Syndrome and The Website Survival Kit, Tony is passionate about helping businesses of all size get the most out of their online presence.